The Body Shop Drops of Light is not a new range. They had the serum last year but this year they introduced more products to the line. Initially, I was not keen on trying these because I do not use lightening or whitening products nor do I support them. But, these are brightening products and we all need to those to bid dullness good bye. 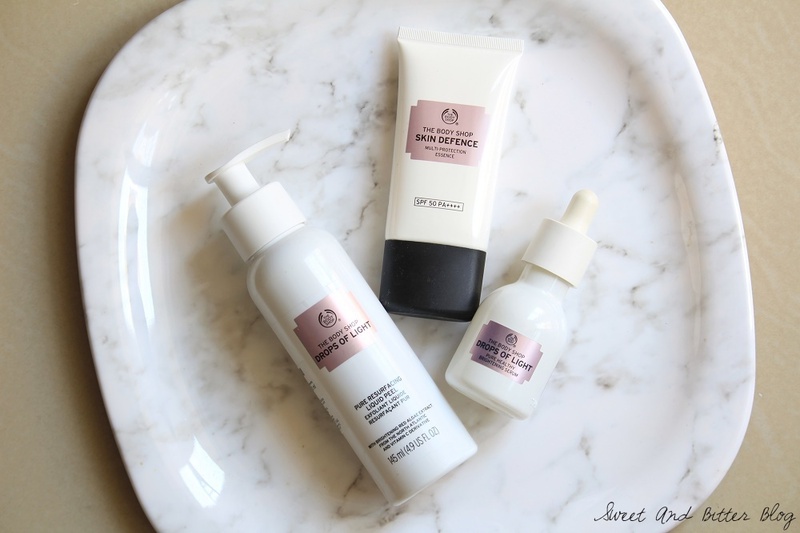 Two of these three are my current skincare favorites. The third isn't. 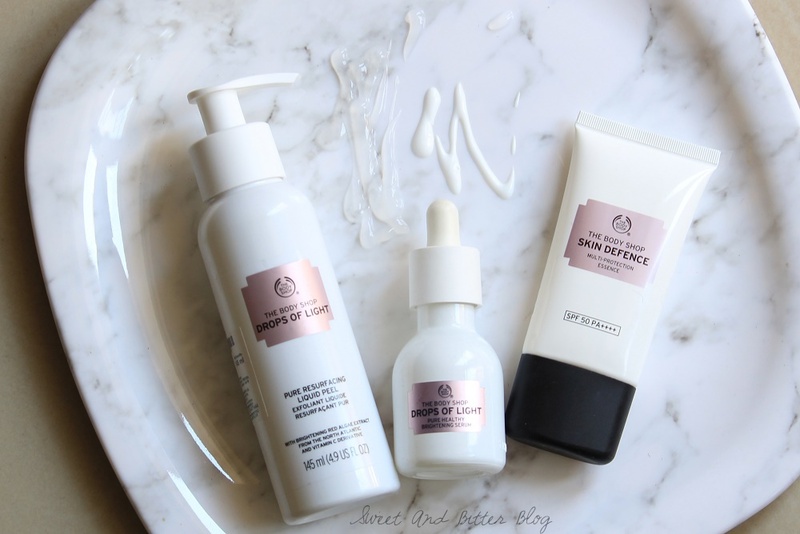 The Body Shop Skin Defence Multi-Protection Essence SPF50 PA++++: This is a star. The high sun protection is a big bonus here. I know one is supposed to re-apply sunscreen but this is the first time I was able to practice what I preach. This is lightweight so, reapplying is easy as it spreads evenly. Though it is white, it does not cause any white-cast issue like most sunscreens. I do not need a mirror to check while I apply this. So, I can top it up on my skin on the go. The best quality is that it neither makes skin look oily nor it is sticky in texture. I absolutely love it. I am about to finish mine. Price: 2,495 for 40ml and 3,195 for 60ml. If you are okay to splurge then go for it. If you know other brands which offer similar light weight, high sun protection, no sweat, zero white cast formula then I am all ears. Maybe something from Korean brands? 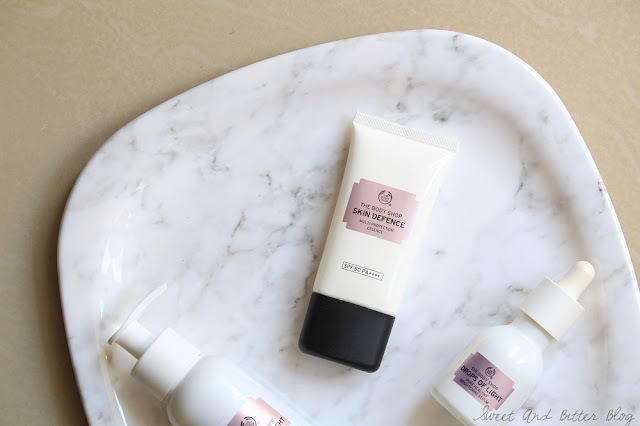 The Body Shop Drops of Light Pure Resurfacing Liquid Peel: This is the first time I ever used a liquid peel and I am in love. The gel-like texture directly targets the dust and dead flaky skin on the skin. It takes a moment to roll up in peels which take out all the dirt. Make sure that you do not keep it for long otherwise it is difficult to wash it off. Also, if you have too much facial hair then it can be a pain. It took me some time getting used to but now I have trained my fingers to avoid areas around eyebrows and ears. I suspected if the texture is just formulated to peel up like that. So, I tried it after I have exfoliated my skin and it didn't peel into balls like it usually does. As it takes off a layer of dead skin and dirt, it leaves behind baby soft skin. You will wonder when you last had such smooth skin. It is tough to keep your hands off after you use it. The Body Shop also has liquid peels in other variants. I also have the same in Drops of Youth line. They work the same and only differ in fragrance. So, choose on depending on the line you like because they are of the same strength. Price: R 2,195 for 145ml. Don't worry about the price because it will last longer. I only need one pump for my face. Do give it a try. 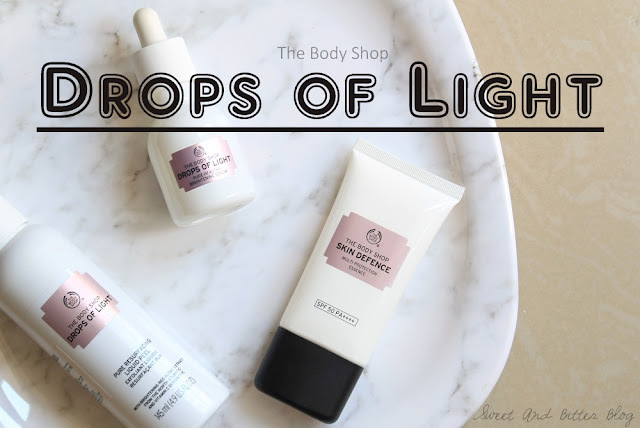 The Body Shop Drops of Light Pure Healthy Brightening Serum: I got this last year. 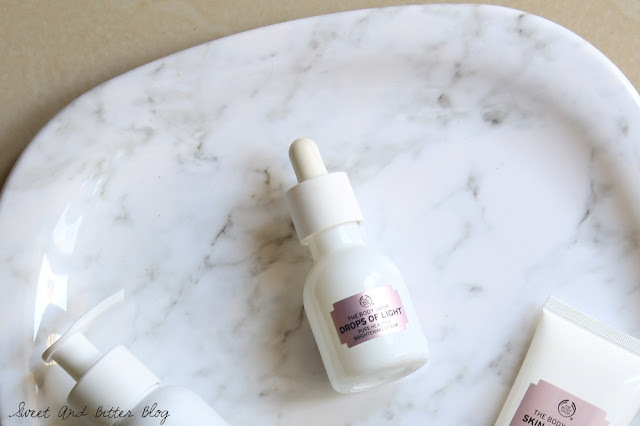 For me, serum is something I used at night to help my skin rejunivate. Though it has the ingredients that I would like to try, the texture is almost like water. So, as a night serum, it is a no. Maybe it topped up with a cream/oil/emulsion it would work better. For day time, one can use it under makeup as it light. Personally, I prefer a drop of light face oil. In the end, I never used for long. Maybe I will see results if I use it for a month but the purpose kind of fails for me. Also, it feels sticky when it is even slightly humid. Price: Rs 2,450 for 30ml. I do not use it so, I won't even recommend it. Simple face oils will work much better than this and will only cost a fraction of the price of the serum.